FreelanceEngine supports the header and footer menus. You can use this to add, sort or display priority information in your site. Choose Create a new menu. Insert Menu name then clicks Create menu. Now you’re good to choose custom links, pages, or categories and add them to your menus. You can also drag the items to the suitable order. Click Add to menu button. Finally, on Menu Settings, select where you want it to appear – in this case, is “Standard Header menu”. Don’t forget to hit Save Menu to complete the setting. 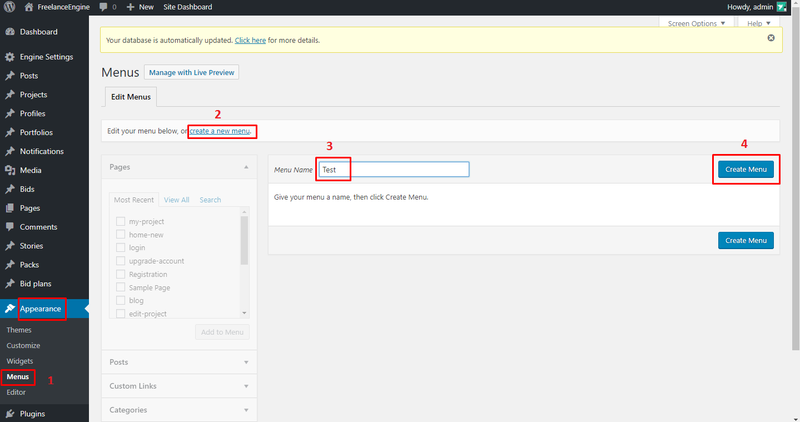 After completing your settings, the Header menu will be displayed as below in the front-end. 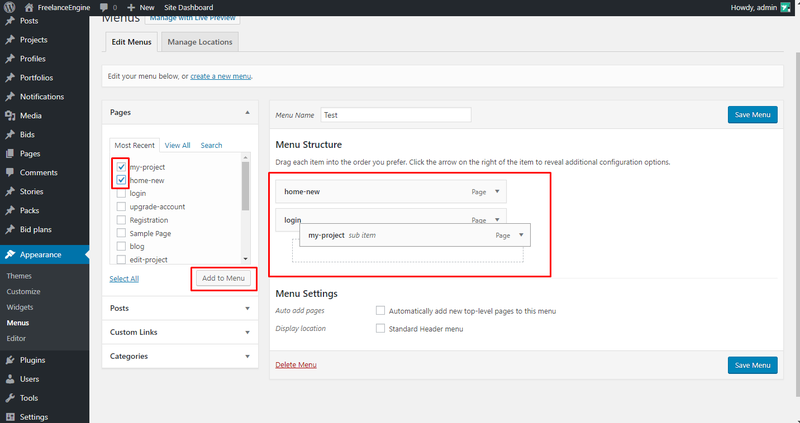 You can do the similar settings for footer menu. How to use the widgets? From the back–end, choose Appearance → Widgets. FreelanceEngine supports one more widget beside all default WP widgets: Fre Social. This widget will display all your social networks information. Currently, FreelanceEngine has already supported the footer sidebars. These sidebars are located at the end of each page. We divide this sidebar to different columns so that you can inform more information about your site. You can simply drag and drop these widgets to suitable ones: As you can see, we have added: Custom menu and FrE Social in the sidebars. It will automatically Save to keep all your settings.